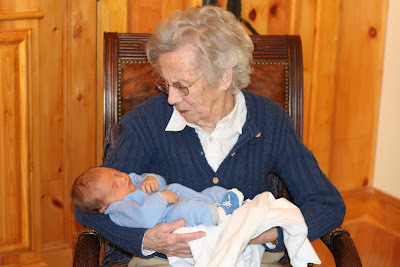 Great Grammy Clare gets a chance to hold her twelfth great grandbaby Holden. 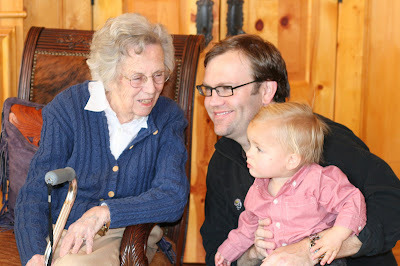 Great Grammy Clare with David and Will. Christy and Chris kicked off their wedding weekend with a festive rehearsal dinner at Austin's Salt Lick, argueably the best barbecue in town and perfect Texas venue for the many out of state guests. The lovebirds with David and Chris's fun loving and warm parents Mary and John. We feel lucky to have Chris and his parents join our family. Looking forward to building memories over the years to come. 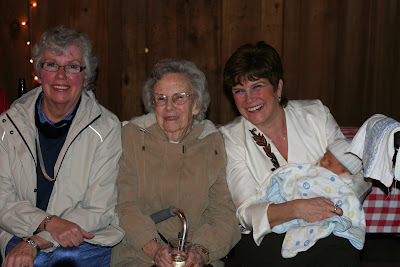 Aunt Faith, Great Grammy Clare, Aunt Betsy with Holden. In this photo Unlce Ben, Uncle Charlie, Mother of the Bride Clare, Aunt Jules, Aunt Barb, Aunt Patty and Uncle Bill. 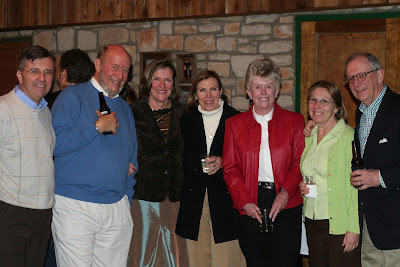 It was a mini family reunion with four of Clare's five siblings making the event and a handful of cousins plus the special treat of Clare's mother Clare attending. 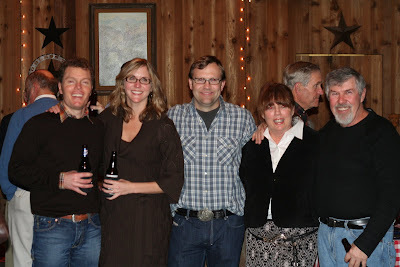 Bill's sister Barb and her husband Bill were also able to join as well as their son Scott and his wife Kim. 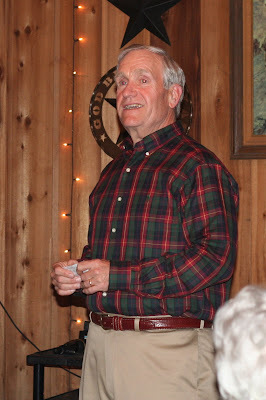 Father of the bride giving a heart warming speech. Lily is talking a blue streak these days. When she tries to say 'Holden' she purses her lips and says 'who' 'who'. I'm happy to report that Holden has recovered from his jaundice, no more daily trips to the doctor for blood draws. Unfortunately Saturday I started getting a horrible allergic reaction. Later I found out it was likely from the glue that they use for c-sections. I got hives a couple inches above and below my incision, great big welts that started out itchy and ended up burning. 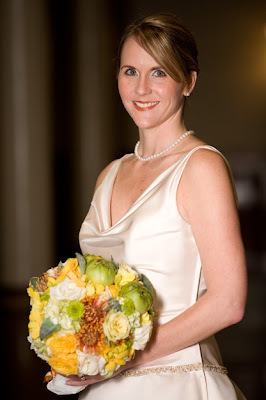 Luckily most of the pain didn't set in until after David's sisters wedding - more on that beautiful event in a bit. I spent most of Saturday night absolutely miserable. The on call Dr. fit me in first thing Sunday morning. I had a mini breakdown and left with three scripts and several over the counter remedies to ease the pain. By the end of the day it was tolerable. Holden is settling into the family nicely. 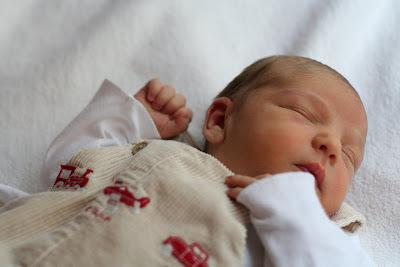 It is the 'honeymoon' time where newborns are sleepy most of the time but he seems to have an easy going temperment, a big appetite and sleeps peacefully. He does have a bit of jaundice that we have been monitoring closely. Hopefully tomorrow's blood tests will begin to show some resolution. Will, Evan and Lily like to give the baby kisses and point out his nose, eye, toes or share their bottles. They seem to delight in having a baby home with us, especially Lily. It appears we are lucky that they are a bit too young for the jealously to set in. Or a least we have not seen it yet. Nursing is going well so far. Except that my body seems to think I have three babies to feed again. The milk coming in is more painful than the c-section recovery. I've had to pump in addition to nursing to get at least some comfort, the upside is that Dad and Grandparents have been able to participate in the bonding of feeding time. Meanwhile, it's normal busy routine for the triplets. At some point we will need to figure out how to share bedtime stories with four. My other baby, my big project, launched today. Dell announced it's partnership with Windows and (RED). 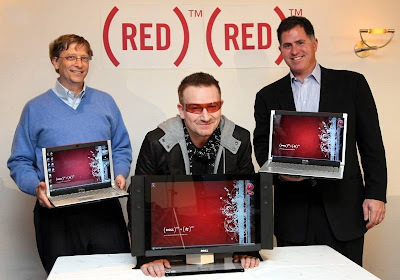 Dell and Windows will contribute from $50 to $80 per sale of a (PRODUCT) RED system to the global fund to help eliminate AIDS in Africa. I led the development of the of the www.dell.com/joinred site that launched today in the US as well as merchandising on Dell.com and joinred.com. We will roll out the launch to over 30 countries next week. Keep an eye out for our Dell (PRODUCT) RED commercial to air during the Super Bowl next weekend. This weekend my sister is getting married. What a big day for the Freas family! It's heartwarming to see my sister so happy. 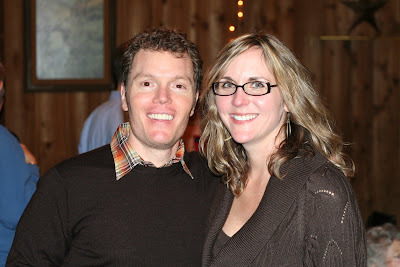 I'm looking forward to having a brother-in-law and fortunate that Chris fits really well with my group of friends. Jennifer and I have made plans to have Marah and Carmen care for the trips Saturday while Holden gets to attend the wedding with us. Plenty of family is in town and it will be great to celebrate with them. I'm going to sneak a camera with me to capture some good pix, so stay tuned. Last night Holden snoozed for 15, fed for an hour, repeat. Poor Jennifer. We get a call this morning on our home phone. Caller ID shows a Hispanic name. Carmen should be here any minute. I am worried. "Uno momento" and I pass the phone to Jennifer whose Spanish is getting quite good now a days. The look on her face says it all. Carmen isn't able to make it until tomorrow. Today is our anniversary and we were hoping to be able to get out and enjoy some time with each other (with Holden in tow of course). Not gonna happen. It was a joy to spend the day with Lily, Will, and Evan as it turns out. I'm not saying it wasn't exhausting. And I'm still hoping that Carmen shows up tomorrow. There is a sense of satisfaction in going morning to night with them. The trips enjoy a slice of apple in the playhouse. Jennifer takes Holden to first doctor's appt. He passes with flying colors. 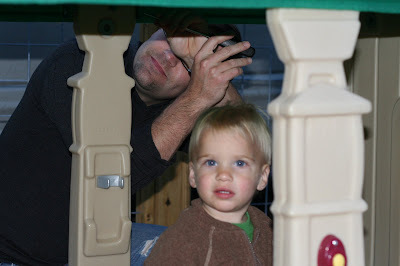 Evan tries to break out of the backyard again. And he would of got away with it too if it wasn't for his meddling father. I take the trips on jog in the triplet stroller. A cold front has come in. Lily steals the blankets from Will and Evan and covers herself three deep in warmth as they protest. Smart girl. A neighbor dropped off dinner for us tonight thankfully. Best pot roast I've ever had. Holden and Jennifer are released from Seton. The trips are the midst of dropping on of their two mid-day naps. And it is painful. Evan copped a few z's, but the rest of the crew was at it all day. Can't wait until Carmen get here tomorrow. Tomorrow Jennifer and Holden will be heading home. Today we have Mara (a super-nanny who cares for another set of triplets) and Grammy Clare helping. I had solo morning duty from 6:30am to 9:30am, but after that Gloria was up and and Will and I were able to bring Jennifer her Pacha latte fix. After the 11am nap I had some free time. While I considered spending it watching football and drinking heavily, I decided upon a more prudent path: 2 hr nap, trip to Lowe's, 6 mile run, in bed by 9pm (before the Giants game-winning field goal in overtime btw). Tomorrow Carmen will still be recovering from her surgery. My anticipation of a full house is laced with fear. Today Will, Lily, and Evan said hello to their new brother and checking in to see how their mom was doing. Evan immediately smiled and said "baby". "Hey, his nose looks like mine!" Will decides that he'd rather hang with mom. "Wait a second. I used to be the baby!" 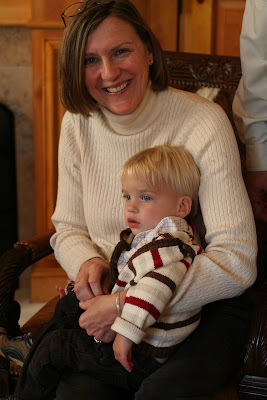 Holden gets some good cuddle time with GG. Lily is intrigued and seems ready to be a big sister. We finally got out of there to let mom and Holden take a nap. At 7lbs 14oz and 19 1/2 inches, this little guy is quite the looker. Gloria, Jennifer, and I had a side bet going on which of our kids he most resemble, finally picking Lily, Evan, and Will respectively. Turns out he looks most like Holden, but you be the judge. Everyone is healthy. Tomorrow morning I'm bringing the trips to see mom and meet Holden. I predict changos en la cama. Today is my mom's birthday. She was hoping she would get to share the day with Quattro but he has decided to stay put a bit longer. She came for Christmas and is staying with us until two weeks after Quattro's arrival to give us a hand and get to know our new little love. We had a simple celebration. We just went out to the movies and saw Atonement with a couple friends. It was a good romantic movie, perfect for a low key Monday night. Friends keep asking us if we are ready for Quattro. I have no idea. I have this feeling I've been to nonchalant about the whole thing and am going to be surprised at how unprepared we are. But then again, the sleep books won't disappear and mega baby stores will not close once he is born. We will just have to re-learn as we go. In many ways it will be an entirely new experience. Presumably a baby straight in our arms and to our hospital room. No NICU nurses to guide us every step of the way and get him on a three hour eating/sleeping schedule before we go home. I didn't get to nurse much with our trio. I may get to experience that closeness and bonding in a whole new way too. It is hard to know what to expect and to anticipate how he will fit into our lives. 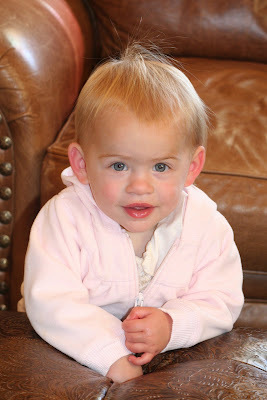 Will we think one baby is a piece of cake after our experience with three infants. Or will not having regular night nannies throw us for a loop? Our trio are 16 months old, how they are going to react to us bringing Q home and into their lives? 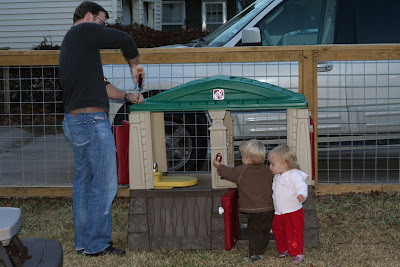 The playhouse arrived and David put it together right after work so the kids could check it out before bedtime. He barely had the frame up and they were already smitten. Evan is probably the biggest fan, he went in and out the door maybe a hundred times last night. They ring the doorbell, open and close the shutters, sit at the little table and chat on the phone...over and over. They could barely wait this morning to get their shoes and jackets on before heading outside to play. Each year we participate in a family football bowl honoring both paternal and maternal grandfathers. Eight families participate plus Great Grammy Clare. Our team had quite a showing this year taking home the family trophy and had several top contenders. Evan, Will, David and his mom each had 18 wins and had to go to the tie breaker to fight for second place with Evan securing the honor. Lily had 15 wins and I had only 13 wins. Next stop, Vegas. DON LEWIS IST TIME WINNER! FAMILY TROPHY RETURNS TO TEXAS! correct picks same as the Vegas Pros. Since Evan Freas is an amateur (not pro) and cannot receive money prizes, the Bowl Commission has decided to put his winnings along with his coaches winnings in escrow for his education fund! Congratulations to all winners and thank you everyone for your participation. Austin has had a slew of warm winter weather recently, very different from last January's record lows and ice storm. Thank goodness we have been able to get outside. It is much easier to keep everyone happy outdoors where they can run free. 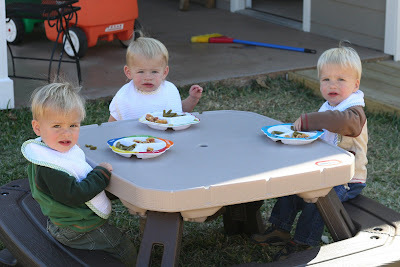 We've had lots of picnics with our new table that Grammy and Papa gave us for Christmas. And since we are on a corner lot with open fencing we get to visit with all of our neighbors and their dogs as they walk by. There are three boys next door, ages 9 to 12 and they like to stop by and entertain our gang. It's a nice break for me. 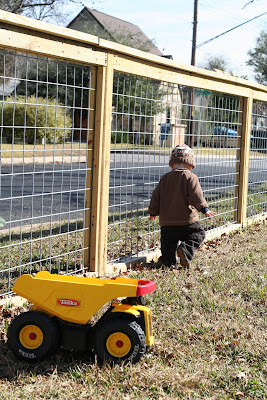 Today Evan figured out how to climb the fence to open the gate latch and he walked right out while we were not paying attention. Fortunately the boys next door saw him and captured him before he made it to the street. We've been talking to the kids a lot about the baby and showing them my belly. They each have there own baby dolls to play with. The baby dolls get hugs and take baths with them. I didn't think they were really grasping the concept of me being pregnant but just the other day I discovered Lily putting her doll under her shirt. So she may be getting it just a little bit.